1. Preheat the oven to 230˚C, gas mark 8. Put the peppers on a baking tray, rub with ½ tbsp olive oil and roast for 30 minutes, turning halfway, until the skins are charred. Meanwhile, put the chicken breasts in a bowl. Whisk together the honey, garlic, zest and juice of 1 lemon and the remaining 1 tbsp olive oil; season and pour over the chicken. Set aside to marinate for 30 minutes. 2. Put the cooked peppers in a sealed plastic bag and allow to cool. Turn the oven down to 160˚C, gas mark 3. Heat an ovenproof frying pan over a medium heat. Add the chicken, skin-side down and cook for 3-5 minutes, until the skin is crisp. Turn over and transfer to the oven for 8-12 minutes, until cooked through. Put on a board, loosely cover with foil, and allow to rest. 3. Meanwhile, wipe the pan clean and heat over a medium-high heat; add the chorizo and cook for about 5 minutes, until crisp and releasing its fat. Use a slotted spoon to lift the chorizo onto a plate, keeping the oil in the pan. Turn the heat down, add the beans and cook for 15-20 minutes until crisp, stirring occasionally. 4. Peel the skins off the peppers, deseed and thinly slice. 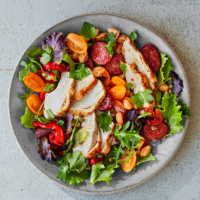 Scatter the salad leaves over a serving platter; top with the peppers, chorizo, beans, tomatoes and capers. Slice the chicken and arrange over the top. In a small bowl, whisk together the sherry vinegar, extra virgin olive oil and remaining lemon juice. Season and drizzle over the salad. Scatter over the parsley and serve.